Yes, I know summer is still over a month away, but with the weather finally getting tolerable up here (above 50 degrees), I have already begun planning my summer reading list like the nerd that I am. I wouldn’t quite consider myself an avid reader, but I sure do love a good book. So whether you’ve started your own summer reading list or you didn’t plan on picking up a book this summer, I’ve got a book you should consider throwing in your beach bag. I assure you that this read is as entertaining as it is enlightening. The book is called Six Months in Sudan and is about a doctor volunteering with the organization Doctors Without Borders in, you guessed it, Sudan. 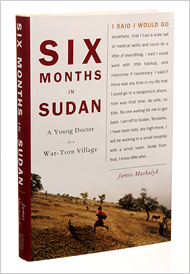 The book is based off blog posts written by James Maskalyk while volunteering in the small Sudanese village, Abyei. He began the blog as a way to bring readers closer to his experiences and the lives of the locals in the war-torn village. And I think he does a great job of that. He breaks down the distances (geographic, emotional, and cultural) that often times hinder people from understanding and helping one another. He explains that it is these distances, not our indifference, that hinder action. I will admit that there are times when this book is very hard to read. There are a few excerpts that would be labeled “viewer discretion advised” if it were a TV show. I mean a majority of the book takes place in a hospital. Not always pretty, if ya know what I mean. I hope you take a moment to enjoy this book. If you live near me, you’re welcome to borrow mine! But you better give it back! Categories: Uncategorized | Tags: book Reviews, Books, Doctors Without Borders, Global, Good Read, Sudan, Summer | Permalink.